Skylanders beware you are under attack from the Drow Zeppelin! Take the cannon and use Eye Brawl to shoot down this enemy airship before it is too late. Place this set with other Mega Bloks Skylanders Giants sets to build the ultimate adventure and customize it so its exactly how you want it. Grab the cannon and take aim – Eye Brawl needs to shoot down an attacking Drow Zeppelin. The buildable Drow Zeppelin is an aerial menace to Skylanders everywhere! Comes with a collectible translucent Troll Greasemonkey pilot. 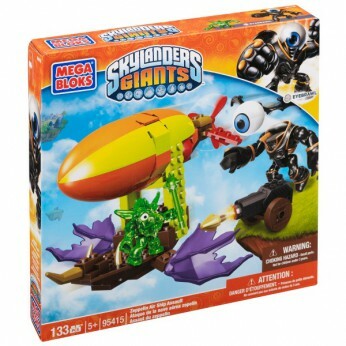 Combine with other Mega Bloks Skylanders Giants sets to build your adventure! For ages 5 years and over; Manufacturer’s lifetime guarantee; EAN: 065541954151. WARNING(S): Not suitable for children under 3 years old. Only for domestic use. This toy costs approximately £19.99 (for the latest and best prices make sure you check our retailer list for the Mega Bloks Skylanders Zepplin Air Ship Assault above). In our review of Mega Bloks Skylanders Zepplin Air Ship Assault we classed it as being suitable for ages 6 years, 7 years, 8 years, 9 years, over 10 years but recommend you check the manufacturer specific advice before purchasing.